"The Little Couple" stars Dr. Jennifer Arnold and Bill Klein are about to become a trio. "We are thrilled to announce that we are adopting a beautiful young boy from China," the pair told their TV viewers. "We are so proud to welcome William to our family and look forward to bringing him home." 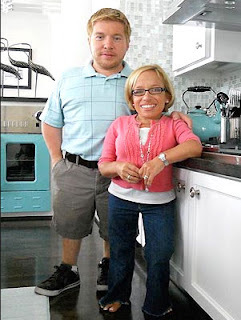 Bill and Jen worked with Chidren's Hope International and Rainbow Kids to find their son, a 3-year-old boy, who has dwarfism like both of his new parents. William is the first child for this happy couple. Since 2009, viewers have followed the businessman and pediatrician, both of whom are under 4 feet tall, as they navigated marriage, managed challenging careers and attempted to expand their family. MARK YOUR CALENDARS - The sixth season of "The Little Couple" premieres on TLC on Tuesday, April 30. Viewers will be able to see Bill, Jen and little William in China!